St Vincent’s Castleknock College is a fee-paying school managed by a Board of Management. The college prepares students for the Department of Education and Skills (DES) Junior Certificate, Transition Year Programme and Leaving Certificate state examinations. The college follows the subject specifications and curricular programmes prescribed by the DES, which may be amended from time to time. The new foyer area, St Vincent’s Hall, which serves as a junction between classrooms, a display area and a meeting point. A refurbished chapel (including the restoration of the magnificent ceiling and the pipe organ). A recording studio, well-equipped music rooms, individual practice rooms and a dedicated band room for ensembles. Student Wi-Fi and printing, including 3D printing. Two dedicated Technical Graphics rooms. 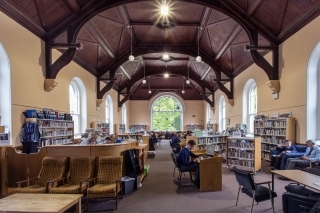 The Alton Library, (formerly the Study Hall), one of Ireland’s largest school libraries, which is open to students from eight in the morning until five in the evening every day for study, reading books or newspapers, research, computer access, chess, and of course, borrowing books. The restored Concert Hall is used for assemblies, school shows (such as Les Miserables, Beauty and the Beast, Miss Saigon), prize-givings and debates. It also houses a photographic display of rugby teams throughout the decades. The college is situated within 70 acres of beautiful mature parkland which includes ten rugby pitches, a soccer pitch, a gymnasium (with basketball court and climbing wall), a strength and conditioning centre with recovery and physiotherapy rooms, athletics and running track, two throwing circles for discus and hammer, a tartan-track long jump and a cricket crease with nets and pavilion. Outdoor all-weather facilities include five floodlit tennis courts and a separate floodlit, all-weather rugby practice area both of which can also be used for soccer or Olympic handball. The average number of students per class is 22. There are approximately 100 students in each year. There may be some optional subjects which lead to smaller classes and others which lead to bigger classes.